When it comes to starches, sweet potato and potato are in a long-running contest. Do you know that potatoes are one of the most consumed foods in the world, bested only by rice, wheat and corn? On the other hand, the sweet potato is often seen as the healthier version of the regular white or yellow potato, but is that really true? The good news is that the nutrients in both are easy to ascertain. Here’s what you need to know when choosing sides between sweet potatoes and potatoes. Here’s the in-depth analysis of nutrients in potatoes and sweet potatoes. This is based on 100 grams of the food. What are the similarities and differences in health effects of the two types of potatoes? Here are some of the great points about them. Both types of potatoes contain starch. Some of that is known as resistant starch which has molecules that our bodies can’t digest. This means thatthey are slow-burn foods, which will keep you fuller longer. This can help you lose weight. In most cases, you want to avoid foods with a high GI, because they tend to play havoc with your blood sugar levels. For this purpose, sweet potatoes may be a better choice than potatoes. However, the GI changes with food type, food preparation techniques, and the combination of other foods. For instance, a boiled potato has a lower GI than a baked sweet potato. In the battle of sweet potato vs. potato, one thing is certain: both are powerhouses of antioxidants. They help combat pathogens, prevent tumor growth, boost the immune system and control inflammation. Sweet potatoes and potatoes with orange, purple, yellow colors are best. These are substances that interfere with how we absorb nutrients, or even act as toxins. Almost all plant foods contain antinutrients, including potatoes and sweet potatoes. Some proteins in potatoes such as papatins and lectins are allergic, especially when eaten raw. But they only affect people with existing intolerances, allergies and autoimmune disorder. Besides, those antinutrients almost vanish with proper cooking, so there shouldn’t be a problem. So who wins the battle of sweet potato vs. potato? It’s important to remember that we’re talking about the potatoes themselves, not the fattening toppings that usually come with them! In the end, they are both healthy; it usually comes down to personal preference. If you want more of certain vitamins, you can go with one over the other. 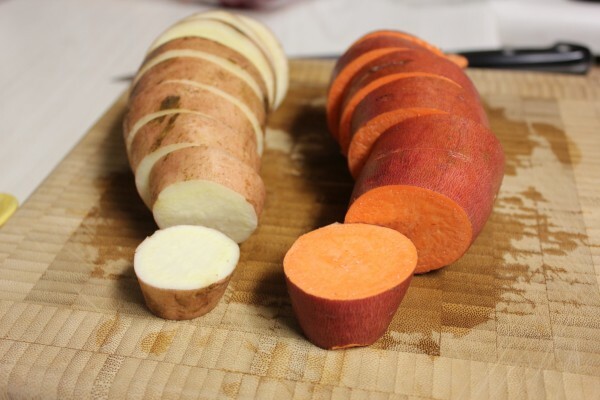 For instance, if you need more Vitamin A, go with the sweet potato, but look for potassium from the regular potatoes. Just remember that no matter which one you choose, enjoying them in moderation is the key to the best health.